Organ Trail is more of a prolonged joke than a game. Anything based on Oregon Trail would have to be, I suppose. For those of you who aren’t children of the 1990s, Oregon Trail was a computer game released to schools on floppy diskette. The player assumes the role of a man guiding his family across America to Oregon by means of covered wagon. Raging rivers, bears, and dysentery stand in the way of your family and a new life in the west. 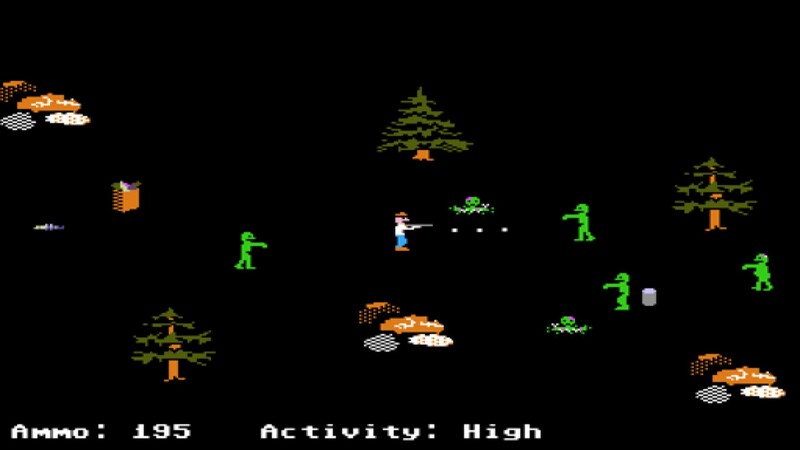 Like its contemporaries Spellevator and Number Muncher, Oregon Trail was a poorly veiled attempt to teach children through video games. You’d be hard-pressed to find someone who learned a damn thing about American history from Oregon Trail though. Most of my peers spent their time honing their killing skills in the hunting mini-game or orchestrating terrible deaths for family members they named after classmates. The educational software genre is ripe for parody, so I wasn’t entirely surprised to learn of Organ Trail‘s existence. Capitalizing on the zombie fad that has been smouldering with popularity in recent years, Organ Trail replaces the covered wagon with a station wagon and dysentery with a zombie outbreak. Asides from these stark changes, not much else has changed. Your goal is still to move your family across the country. The graphics still look like vomited up pixels. And the hunting mini-game is still the best part. Asides from a few token new features – such as shootouts with bandits – this is the same game that graced floppy diskettes 20 years ago. And there’s nothing wrong with that. Organ Trail is not the kind of game you clock dozens of hours into on your own. The intentional crudity of it doesn’t make that palatable. 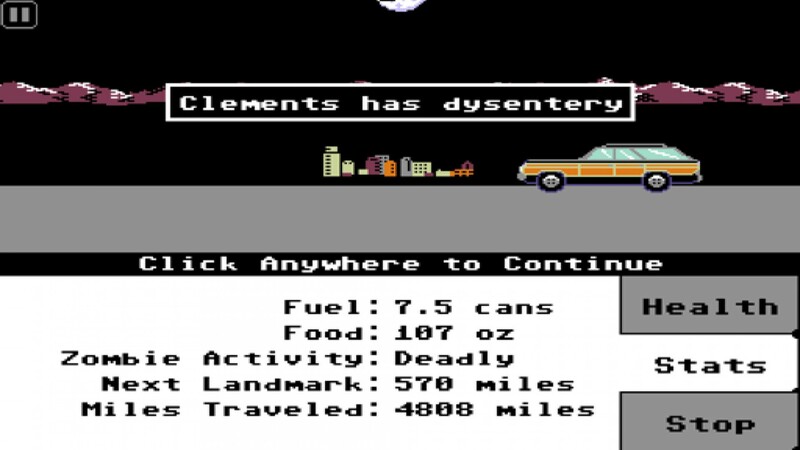 Organ Trail is an experience game. It’s the kind of game you boot up when you have friends over to laugh at the sheer ridiculousness of the premise and to let waves of nostalgia wash over you. A point proven by the dozens of exhibitionist Let’s Play videos of the game floating around Youtube. Organ Trail is as much as game to be spectated as it is to be played. It’s interesting how pervasive parody games have become over the past few years – DLC Quest and Half-Minute Hero immediately spring to mind. Whether this can be owed to a disinterest in the fare offered by mainstream developers or to the current exaltation of the nostalgic in our popular culture, I can’t say. I am glad, however, that Steam Greenlight is giving wackier premises like this a foothold in digital distribution. 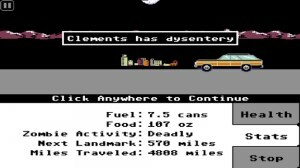 I don’t have much else to say about Organ Trail. 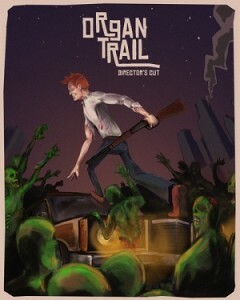 It’s Oregon Trail with zombies; you’re either tantalized by that premise or you’re not. The game is probably worth the modest $4.99 price tag, but play it with friends, or don’t play it at all.